The ARCUS June Arctic Sea Ice Outlook | Watts Up With That? Download High Resolution Version of Figure 1. WUWT is second highest, at 5.5 million sq km. Notably missing this year is “Wilson”, who in the last two years started out with impossibly low values such as 1 million sq km. I’ll repeat the poll next week in preparation for the July Outlook. In the meantime, check the WUWT Sea Ice Page for the latest. With 19 responses, including several new contributors (thank you), the June Sea Ice Outlook projects a September 2011 arctic sea extent median value of 4.7 million square kilometers with quartiles of 4.4 and 4.95 million square kilometers (Figure 1). This compares to observed September values of 4.7 in 2008, 5.4 in 2009, and 4.9 in 2010. The distribution of the June Outlooks is skewed toward lower values, with a range of 4.0 to 5.6 million square kilometers, suggesting either persistent conditions or a substantial drop below 2008 and 2010 values and the long-term downward trend. The 2011 June Outlook differs from the 2010 Outlook by not including projections of major increases in extent. It is important to note for context that all 2011 estimates are well below the 1979–2007 September climatological mean of 6.7 million square kilometers. Individual responses were based on a range of methods: statistical, numerical models, comparison with previous observations and rates of ice loss, composites of several approaches, or ‘educated guesses’ based on various datasets and trends (included in the heuristic method category). The median of individual uncertainty estimates, where provided, is ±0.6 million square kilometers (near the values suggested from last year), with quartiles of ±0.5 and ±0.9. Similar to the 2010 Outlook, the range of the four numerical modeling methods represents examples of both persistence and low Outlook values. The range of all Outlook values and the range of Outlook values within method categories are larger than implied by individual uncertainty estimates, suggesting most uncertainty lies in the separate approaches to the Outlook. Still, the consensus of a stable low level of sea ice extent or continued modest sea ice loss is a strong result. Outlooks are not firm forecasts, but promote a discussion of the physics and factors of summer sea ice loss. Again in 2011, we are pleased at the extent of methods and discussion and thank the contributors for their efforts. Figure 1. Distribution of individual Pan-Arctic Outlook values (June Report) for September 2011 sea ice extent. As discussed in the section below on late spring 2011 conditions, May 2011 looked similar in many respects to May 2010 and supports an early sea ice loss. Total sea ice extent for the previous three months was near or below the level of 2007, the year with the lowest minimum summer ice extent during the satellite record. Ice-free areas were beginning to open up in the northern Kara Sea and north of Bering Strait. There were arctic-wide positive temperature anomalies with hot spots in recently open water areas. The Arctic Dipole (AD) climate pattern, which advects heat and moisture across the western Arctic from the south, is present. However, the Climate Prediction Center’s 8- to 14-day atmospheric forecast suggests a weakening of the AD during June. This brings up one of the most important questions in arctic science. The September sea ice extent for every year since 2007 has been lower than all extents prior to 2007 (Figure 2) and there is no reason to expect 2011 to be wildly different. Does this suggest a new level of reduced summer ice extent persisting at around 5.0 million square kilometers, relative to a value of 6.0 million square kilometers in the early 2000s? If so, what is driving this transition and when will summer sea ice extent drop down to a lower level? Climate models suggest periods of stability (with variations around a stationary summer mean extent) with intermittent years of rapid reductions in ice extent as the Arctic warms (see Serreze, Mark C. 2011. Climate change: Rethinking the sea-ice tipping point. Nature 471, 47–48, doi:10.1038/471047a). Perhaps the ice extent in summer is conditioned by the rapid growth rate and thickness of the newly expansive regions of first-year sea ice? Are these regions of first-year sea ice vulnerable to early melt? Or will it take additional arctic warming to increase the probability for the next major drop in summer sea ice extent? The contributors to the 2011 Outlook suggest a modest decrease for summer 2011. Figure 2. 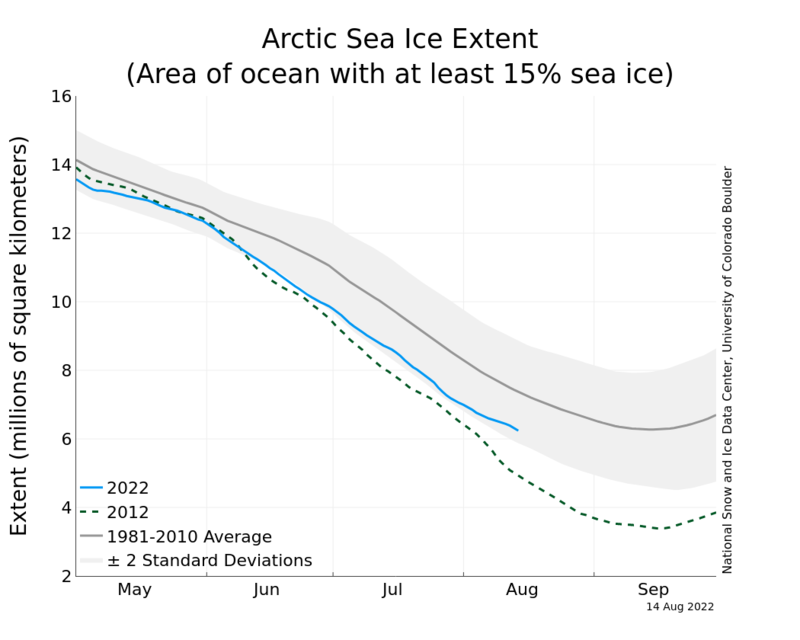 NSIDC chart of September sea ice extent during the satellite data era through 2010. Regarding initial conditions for Spring 2011, Figure 3 by Jim Maslanik and others shows maps of sea ice classes derived from sea-ice age for the end of January and May 2011. Their approach to determining sea-ice age is based on tracking of sea ice using satellite imagery. Purple regions are areas of first-year sea ice. An interesting feature in both images is the tongue of old sea ice (white) extending into the southern Beaufort Sea. According to Maslanik, “the reduced extent apparent at the end of May compared to January reflects transport associated with a mostly positive Arctic Oscillation situation in winter, followed by negative Arctic Dipole (positive dipole anomaly) in April and May. Please keep in mind that these maps basically indicate areas where at least some multiyear (MY) ice is expected to be present rather than areas where MY ice is prevalent.” (personal communication). The ice age plot is supported by several ice thickness flights carried out by the Alfred Wegener Institute in collaboration with University of Alberta and University of Alaska Fairbanks in this region, which found a thinner mode of total level first-year ice thickness north of Barrow (1.4 m compared to 1.7-1.9 m in previous years) and little, comparatively thin multiyear ice in regions showing old ice in Maslanik’s data. Pending further analysis, there are indications that this situation—presence of some MY ice mixed in with substantial amounts of first-year ice—is increasingly common. This also helps explain differences in ice type distributions obtained from radar- and passive microwave-derived MY ice extents. Figure 3. Sea-ice age estimates showing conditions during January and May 2011. Credit: Maslanik and Fowler. Figure 4 shows a loss of sea ice extent through May below the 2007 level (National Snow and Ice Data Center plot); contributions to the loss were especially important from the Barents and Chukchi Seas (Figure 5). Similar to 2010, such loss can be related to warm temperatures throughout the Arctic during May (Figure 6). Given the hint of a sea ice-free region near the New Siberian Islands (off the Siberian Coast) in Figure 5 and the temperature maximum in Figure 6, one might suggest an early sea-ice melt along the Siberian coast this summer. The North Atlantic Oscillation turned positive in spring and can be seen as low sea level pressures over Iceland during May 2011 (Figure 7). Compared to positive temperature anomalies over southern Baffin Bay as in 2010, temperature anomalies are now negative. Stroeve has pointed out that we had an Arctic Dipole (AD) pattern in May 2011 with geostrophic flow directed across the top of the Arctic (Figure 7); this contrasts with May climatology, which has high pressure over the central Arctic and weak gradients. However, the AD pattern may be weakening in June, according to the Climate Prediction Center’s 8- to 14-day forecast. Overall, the curve shown in Figure 4 is commensurate with the notion that a thinner arctic ice cover that is more mobile in May 2011 can lead to continuing relative sea ice loss. Figure 4. Daily sea ice extent as of 4 June 2011. The solid blue line indicates 2011; the dashed green line shows 2007; and the solid gray line indicates average extent from 1979 to 2000. The gray area around the 1979–2000 average line shows the two standard deviation range of the data. Credit: National Snow and Ice Data Center (NSIDC). Figure 5. Sea ice extent for the beginning of June 2011, relative to climatology (1979–2000 median, denoted by the orange line). Figure 6. Near-surface air temperature anomalies for May 2011. Credit: NOAA/Earth System Research Laboratory. Figure 7. Sea Level Pressure field for May 2011. Credit: NOAA/Earth System Research Laboratory. Key statements from the individual Outlook contributions are below, summarized here by author, organization of first author, Outlook value, standard deviation/error estimate (if provided), method, and abstracted statement. The statements are ordered from highest to lowest outlook values. Each individual contribution is available in the “Pan-Arctic Individual PDFs” section at the bottom of this webpage. We should have another interesting season this year; stay tuned for next month’s Outlook in July! Reason: eyeballing current shape in 2011 – looks like 2005. For the present outlook the coupled ice-ocean model NAOSIM has been forced with atmospheric surface data from January 1948 to 18 May 2011. This atmospheric forcing has been taken from the NCEP/NCAR reanalysis (Kalnay et al., 1996). We used atmospheric data from the years 1991 to 2010 for the ensemble prediction. The model experiments all start from the same initial conditions on 18 May 2011. 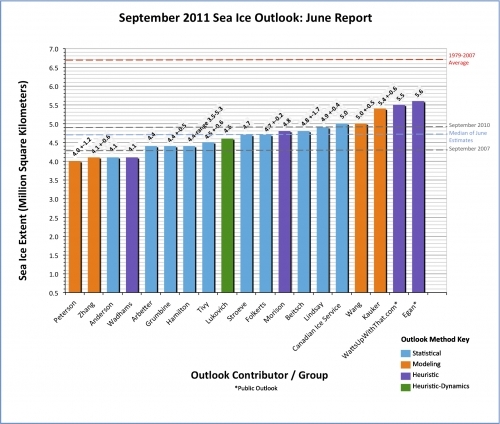 We thus obtain 20 different realizations of sea ice development in summer 2011. Since the forward simulation underestimates the September extent compared with the observed extent minima in 2007, 2008, and 2009 by about 0.49 million km2 (in the mean), we added this bias to the results of the ensemble. It is not clear whether the bias is caused by an imperfect sea ice-ocean model or by imperfect initial or boundary conditions. The outlook is based on a CFSv2 ensemble of 40 members initialized from 17-26 May 2011. The model’s systematic bias has been removed based on its retrospective forecasts for 1982-2010. As with Canadian Ice Service (CIS) contributions in June 2009 and June 2010, the 2011 forecast was derived using a combination of three methods: 1) a qualitative heuristic method based on observed end-of-winter Arctic Multi-Year Ice (MYI) extents, as well as an examination of Surface Air Temperature (SAT), Sea Level Pressure (SLP) and vector wind anomaly patterns and trends; 2) an experimental Optimal Filtering Based (OFB) Model which uses an optimal linear data filter to extrapolate NSIDC’s September Arctic Ice Extent time series into the future; and 3) an experimental Multiple Linear Regression (MLR) prediction system that tests ocean, atmosphere, and sea ice predictors. Our statistical prediction is made with PIOMAS model data from the average of May 2011. We are using May data for the 23 years 1988 through 2010 to fit the regression model and then the ice conditions for 2011 to make the predictions. The best single predictor is the fraction of the area with open water or ice less than 1.0 m thick, G1.0. This predictor explains 77% of the variance. So far this year, ice conditions seem to be similar to last year, and indeed considering the Northern Sea Ice Anomaly plot from David Chapman’s Cryosphere today Website, the annual cycles of extent since 2008 have been similar. The ice in the central Arctic Ocean in April during this years North Pole Environmental Survey (NPEO) deployment was again dominantly first year ice, but seemed more deformed than usual suggesting greater average thickness, a positive factor in extent. The winter 2010-2011 Arctic Oscillation was negative at least initially, a positive factor for ice extent in September, but over the whole winter not as negative as 2010. Estimates are based on multiple regression of a wide variety of publicly available monthly arctic data (e.g., extent, area, sea surface temperature, North Atlantic Oscillation, and so forth). Data from 5 to 18 months before September (i.e., from March of the previous year thru April of the given year, but not from May) were correlated with the September monthly average extent data during the period 1979-2010. NSIDC is using the same approach as last year: survival of ice of different ages based on ice age fields provided by Chuck Fowler and Jim Maslanik (Univ. Colorado, Boulder). However, this year we are using a revised ice age product, one based on a 15% sea ice concentration threshold rather than the earlier version, which used a threshold of 40% (see Maslanik et al., in review for more details). Investigation of dynamical atmospheric contributions in spring to sea ice conditions in fall, based on comparison of 2011 and 2007 stratospheric and surface winds and sea level pressure (SLP) in April and May suggests regional differences in sea ice extent in fall, in a manner consistent with recent studies highlighting the importance of coastal geometry in seasonal interpretations of sea ice cover (Eisenman, 2010). The absence of anomalous features evident in 2007 in SLP and stratospheric and surface winds in spring in 2011 indicates that accelerated decline associated with the former will not be an artifact of dynamical phenomena, although a thinner and more mobile ice cover may lower the wind forcing threshold required for increased ice export. Lower ice concentrations in 2011 relative to 2007 in late May indicate increased sensitivity of the arctic ice cover to atmospheric dynamical forcing, with implications for ice transport during summer. Statistical – canonical correlation analysis (CCA). A persistence forecast based on February ice concentration anomalies is generated using CCA. February is chosen over May because the correlation with September extent is higher. The model is trained on the 1980-2010 period using the passive microwave derived data set (nasateam). NSIDC monthly mean extent reports from September 1979 through September 2010. The physical basis of the statistical method is to model the growth of open water as a feedback process analogous to population growth under constraint. This produces a logistic curve. The statistics are used to estimate the three parameters for such curves. The system determines the relationships between sea ice and atmospheric conditions over the past ten years to determine the likelihood of ice being present this year. The model uses SSM/I sea ice concentration, NCEP 2m Air Temperature, and NCEP Sea Level Pressure, and correlates each point with every other point in the domain, in a brute force multiple linear regression. Based on recent EM measurements of first year ice thickness merged into probability density functions of ice thickness from recent submarine voyage and subtracting an assumed summer melt of up to 2 m.
We have looked into the yearly change of the sea ice area. This would be a first order indication of the fraction of ice that melts. Since it is the area that is measured this does not account the variation of sea ice thickness, which is needed to understand the total melt. All the data used are taken from http://arctic-roos.org/. The simplest way to look at this is to take the difference between the maximum winter sea ice area (Aw) and compare it with the minimum area (As) the following summer season. Fig. 1 [see PDF of contribution in section below] shows the value (Aw –As) /Aw from 1979-2010. This is based on numerical ensemble predictions starting on 6/1/2011 using the Pan-arctic Ice-Ocean Modeling and Assimilation System (PIOMAS). The ensemble consists of seven members each of which uses a unique set of NCEP/NCAR atmospheric forcing fields from recent years, representing recent climate, such that ensemble member 1 uses 2004 NCEP/NCAR forcing, member 2 uses 2005 forcing, and member 7 uses 2010 forcing. This projection is an experimental prediction from the UK Met Office seasonal forecast system, GloSea4 (Arribas et al., 2011). GloSea4 is an ensemble prediction system using the HadGEM3 coupled climate model (Hewitt et al., 2011). A further bias toward lower ice thicknesses in the actual forecast as compared to the hindcast initialization is also suspected. Therefore, we suspect that our forecast may be biased towards a smaller ice extent from the ultimate reality. Furthermore, this bias appears to become even more exaggerated with later start dates, hindering our ability to update the forecast at a later time. Excellent, comprehensive article! I voted 5.0 million Km, which puts me right with the Canadians. I can handle that. Got my popcorn, sitting on the edge of my seat, following the curve and waiting for the reports to come in. Oh, the excitement of watching ice melt! I can hardly stand it! We expect to get the RC forecast sometime next year, maybe. jorgekafkazar: Yes, it’s as exciting as watching the ups & downs in your bank account by the minute…but at the end of the day, these may actually tell you something (like not investing into crooked pyramid schemes for fear of imminent bankruptcy). What does expanding the years of 1979–2007 do to the September climatological mean of 6.7 million square kilometers? I’m sure many people have been annoyed at the focus on that time period as if it represents “Normality”. I’m also sure someone has already graphed what an expanded time period would do to the mean. No doubt the ice extent was far in excess of the 1979-2007 mean during the cold years from 1945-1975. 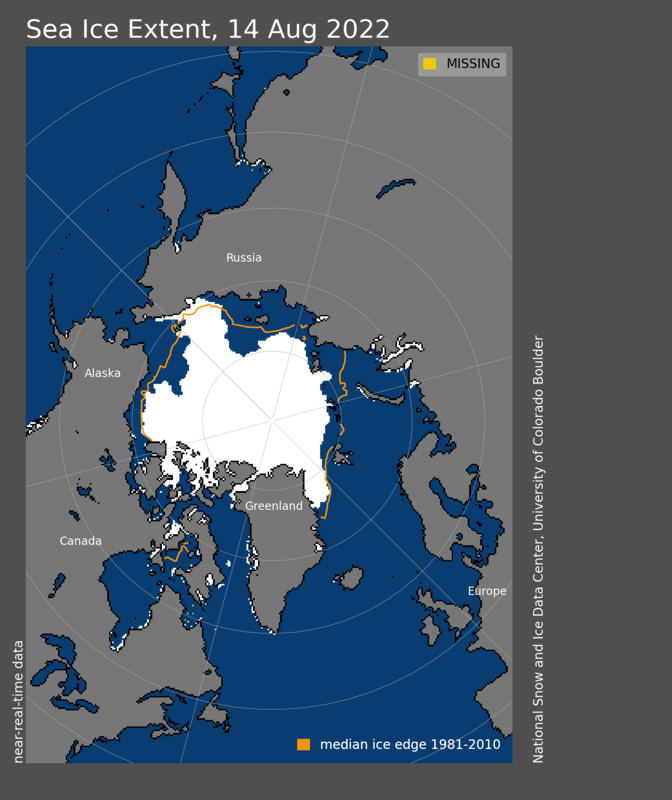 What is the arctic sea ice extent mean for 1945 – 2010? Could you ‘bottom-line it’ for idiots like me? Does the data support the claims of the global warmists or not? Sorry if I am missing this, but a single picture is proof of what exactly? However, a further bias toward lower ice thicknesses in the actual forecast as compared to the hindcast initialization is also suspected. Therefore we suspect that our forecast may be biased towards a smaller ice extent from the ultimate reality. I’m not so much interested in how much the ice extent has varied but rather why it has varied. What is the main factor behind the reduced sea ice extent? Has the Arctic temperature since 1978 increased and if so by how much? Is any known increase enough to explain the ice loss? Has precipitation in the form of snow fallen over the past 30 years after sea ice has begun to form? Have ocean currents changed to increase the flow of warm water from the Atlantic and/or the Pacific? I took something around 5M km2. My guess was simply based on the behavior of the ebb & flow about the seasonal meltlines of the last 5 years. 2.) the added area of sub-Arctic waters reach equilibrium with the Arctic waters, which seem to be mixing with each other and making the Arctic relatively warmer. Many very cold winters will conspire to form a ‘step-up’ function to Arctic Sea Ice Extent, and it will come about abruptly. No, the more open water there is, the faster the Arctic radiates IR into space, and the faster the planet cools. This is all very interesting, but no one has an explanation for sea ice extent. That is all that we can learn from the study of Arctic Sea Ice. With the humility of good scientists, we should say that we do not know and leave it at that. Our models are biased to support AGW so we know they are wrong, we are going to hedge our bets and include a large variation of 2.8 to 5.2 so no-one will find us out. £170M a year investment (Nulabor speak for waste) gets you this rubbish. Is the ice cover of Hudson’s Bay included in the ice extent? Have ocean currents changed to increase the flow of warm water from the Atlantic and/or the Pacific? Wow, that’s some kind of interesting physics going on. A warming arctic leads to more ice melt leads to more rapidly cooling planet. So during the past few decades, as the sea ice extent has slowly declined year-to-year, we’ve not seen a rapidly cooling planet, but according to your strange view of physics, we should have. Might want to check your assumptions and pick up a basic climatology textbook. So, does the arctic sea ice data support the “warmists”? Well, it sure doesn’t contradict the notion that AGW could be occurring. Well, Zhang is going to have another miserable year, calling into question yet again how much confidence anyone should have in PIOMAS when it does so lousy at this prediction game. But then, IMO, the WUWT Collective is probably too high at 5.5M. I don’t see right now that anything above 5.2M looks too likely. Where did you get the image? I meant to say, where did you find the *original* image? This is all getting to be cartoon like. So taxation and regulation must be imposed to prevent the 5. The proof of accuracy and effectivenes may not come for decades (or the end of the century) but we’re certain the taxation and regulations will be good regardless of the outcome. Our friend Vuk, just posted this on Tamino’s. Predicting cold Europe, cold and snowy US east coast and wormer Canada with less Arctic ice. Just seasonal freeze and thaw of the ground, it happens a lot in Canada. Once All of Canada was frozen for years, it mostly thaws in the summer now. Tree lines move, growing season move, season change, climate changes, always has, always will. On the other hand, I’d like to see a picture of Jesus, Mary, and Joseph. Strangely enough, it also doesn’t contradict the notion that we’re in a period of natural warming. If there was a follow-on to this, I missed it. OK, I’m not a scientist, certainly not a “climate scientist”, I’m just a mechanical engineer, and I remember vague little snippets from my Heat Transfer class. From what I remember the primary drivers of decreasing ice would be 1) water temperatures and 2) currents carrying the ice into even warmer water temperatures. The data most readily available, and I don’t have a lot of confidence in the data available, is air temperatures. But from a heat transfer standpoint, we take the block of ice as a system, with inputs (in the form of heat) from the water beneath it, which isn’t frozen so obviously is warmer and therefore inputting heat to the chunk of ice at all times, and the loss (or gain in summer) of heat to the air above it. We get ice only when the rate of heat loss to the atmosphere exceeds the rate of heat gain from the unfrozen water beneath. We lose ice when the rate of heat gain from the unfrozen water beneath exceeds the rate of heat loss to the atmosphere. And heat transfer also taught me that the rate of heat transfer, at any given temperature difference, is far more efficient from my subject system to water than it is to air. This tells me that I can suffer LOSS of ice mass even when (if) the air temperature above it is below freezing. So obviously the real driver of ice mass is the water temperature and currents. But I don’t know how to get ahold of that data to do any kind of analysis. What I’m driving at, though, is we should be paying far more attention to the PDO and the Atlantic thermohaline. One commenter on WUWT has frequently tried to focus our attention to the SST if we want to know the heat content of our Earth, and I think he’s right. But now, I’ve laid out the extent of my knowledge, and I don’t know where to go from here, either in the exact calculations I should do, or even where to obtain the data to do them. On to better heads? You are looking at one small patch of ocean and making one of your belief conclusions. A “reasonable person” would look at all the data. Obviously you have not checked the temperatures and news headlines from the 1930’s and 1940’s when they were also worried about the ice melting. What were the Arctic temperatures during the MWP? You have provided no data. Why is there never any mention of the research by Drew Shindell of NASA, that concludes that at least 50% of the Arctic warming is caused by black carbon [soot] from the burning of biomass, mainly in China, India, Indonesia, Brazil? Other researchers have similar findings, and they have spoken to a committee of Congress to call for more urgent mitigation action on this. Shouldn’t scientists be calling for this to be done as a matter of urgency—so that we can see just how much of the warming and melt of the Arctic, Greenland, glaciers and the permafrost is due to black carbon, and how much to other forcings like CO2? In Australia, our economy is about to be thrown into turmoil —revolutionised—with a permanent and progressively- escalating economy-wide carbon tax followed by an ETS , and there’s never a mention of this much more easily-mitigated aspect of the warming and melt from our tax-hungry scientists . Can anyone tell me—has something changed —-are the researchers wrong ? If so, can you please provide a link? So the Arctic is a minor contributor to Earth’s total methane emissions, and they rose an estimated 7% between 2003–2007. This does not seem noteworthy, much less negating the very real effects of wind and currents on sea ice. So I think a reasonable person would come to the conclusion that the Arctic is warmer than it has been in at least several hundred and perhaps several thousand years. The study states that, “Since continuous meteorological and oceanographic data for the Fram Strait reach back only 150 years, the team drilled ocean sediment cores dating back 2,000 years to determine past water temperatures. The researchers used microscopic, shelled protozoan organisms called foraminifera — which prefer specific water temperatures at depths of roughly 150 to 650 feet — as tiny thermometers. So based on some foraminifera shells from the Fram Strait, and a 7% estimated increase in methane emissions, reasonable people are supposed to conclude that “the Arctic is warmer than it has been in at least several hundred and perhaps several thousand years.”? Am I missing something? Can you elaborate? Why do you have so much confidence in forminIfera shells in the Fram Strait as being an accurate proxy for Arctic temperatures over the last “several hundred and perhaps several thousand years”? In such a scenario, a melting Arctic is indicative of massive heat loss to space. It would explain the increasingly colder winters. The returning flow of seawater would take the ocean heat content down rather quickly. A good test of this would be increased melt of sea ice and the sea levels stop rising due to thermal contraction. Try again. Might want to really do a bit of research before making such a ignorant statement. P.S. to Cyrus P Stell says: June 18, 2011 at 6:20 pm: “So obviously the real driver of ice mass is the water temperature and currents.” That may well be part of it since that is one difference between the Arctic and Antarctic. But do not forget that even on land that is covered with ice, the ice melts fast when the sun is at an angle of 23 degrees at the North Pole on June 21 and at a higher angle away from the north pole for at least part of the day. Then the soot factor mentioned above hugely magnifies the effect of the sun. If CO2 had a large role, I would think the Antarctic would melt as fast as the Arctic. How many decades? It isnt “many” is it? There have been reported declines in polar sea ice in the 1800s/1900s and the fifties. The satellite record goes back 30yrs and that started on a high point funnily enough, so the current small decline could be natural. But it also does not preclude natural cyclic variation, in fact natural cyclic variation is far more likely to be the primary cause. I don’t actually care what the sea ice EXTENT is, only the total amount of ice. That would be ice extant AND thickness. Are there any charts showing or predicting this actual amount of ice? When can we expect a newly discovered required “adjustment” in sea ice calculations making it worse than we thought? It’s happened before, and as the death spiral isn’t going as planned, an ‘October Surprise’ may be necessarily forthcoming. Why do you have so much confidence in forminIfera shells in the Fram Strait as being an accurate proxy for Arctic temperatures over the last “several hundred and perhaps several thousand years”? If you don’t believe in science, then the isotopic ratios found in fossilized or mineralized flora and fauna won’t mean anything to you. Biology, chemistry, and physics dictate that the composition of these fossils is determined by the conditions in which they lived. Analysis can reveal what some of those conditions were. It’s not magic, it needn’t be taken on faith, it’s science. The specific details are available to anyone who wants to spend some time reading. The Google is your friend. Might want to really do a bit of research before making such a ignorant statement. That seems like some sound advice. Perhaps you can tell us more about the Fram Strait foraminifera shells that all reasonable people must heed? R. Gates here is a history lesson for you. I am sure you are aware of it and await your response. If CO2 had a large role, I would think the Antarctic would melt as fast as the Arctic. If you think about it for a moment, this intuitive thought is not necessarily true. The earth’s oceans and landmasses are not laid out symmetrically. The arctic is an ocean with a thin layer of ice on top. The antarctic is a landmass with a much thicker layer of ice on it. As a result of these asymmetries (and how they effect oceanic and atmospheric circulation) the same latitude in the arctic is generally warmer than it’s counterpart in the antarctic. Compare the climate data for Qaanaaq, Greenland (formerly Thule) vs MacMurdo Station. The insolation and clearness data would indicate that MacMurdo should be warmer than Qaanaaq, but iMacMurdo is significantly colder. As to the ice itself, gravimetric data indicates Greenland and Antarctica are each losing about 150 cubic km of ice each year – with the rate accelerating. Sea ice is a different story. The arctic appears to be close to an irreversible (on human timescales) loss of sea ice. Antarctic sea ice is growing in extent. “Values of δ11B reported in the literature for Holocene samples of the same foraminiferal species show large variability (6‰) relative to cited precision (< 1‰). This is indicative of significant inter-laboratory biases and raises concerns about the accuracy of foraminiferal proxy pH records." "Despite these problems, careful analysis of similar samples by NTIMS may permit data to be obtained with consistent relative differences that still yield valuable proxy records, but there is clearly considerable potential for inaccuracies to result in such an approach from hard to detect changes in matrix." "Over the past decade, the ratio of Mg to Ca in foraminiferal tests has emerged as a valuable paleotemperature proxy. However, large uncertainties remain in the relationships between benthic foraminiferal Mg/Ca and temperature." "LGM temperatures reconstructed from Mg/Ca and Mg/Li are generally more scattered than core top measurements and may be contaminated by high-Mg overgrowths. The potential for Mg/Ca and Mg/Li as temperature proxies warrants further testing." the science indicates that foraminifera are a nascent and still suspect proxy for temperature. Since when does extrapolating an inaccurate proxy from a small geographic area to the entire Arctic constitute "science"…? I’ve reviewed Tony’s writing many times and highly respect his work. However, I must go with what the hard data and facts are showing. The falling year to year sea ice in the arctic is just one of the measures. The melting permafrost is also saying the same thing…things in the arctic are warming up more than they’ve been since perhaps the Roman warm period…certainly warmer then they were during the MWP and far warmer then they were any time in the past century. There is just too much data telling us this. Having said that, however. It is a different thing altogether to attribute this to anthropogenic factors only. My current thinking is that a warming arctic likely is from rising CO2 levels and related feedbacks, but I would rule out other factors as well, both human and natural. …but I would not rule put other factors as well, both human and natural. I’m not sure what anyone was supposed to take away from that ‘history’ …. for an actual scientific history of the arctic the most comprehensive look, taking into account virtually every scientific paper on the subject, can be found here History of sea ice in the Arctic. However, I must go with what the hard data and facts are showing. 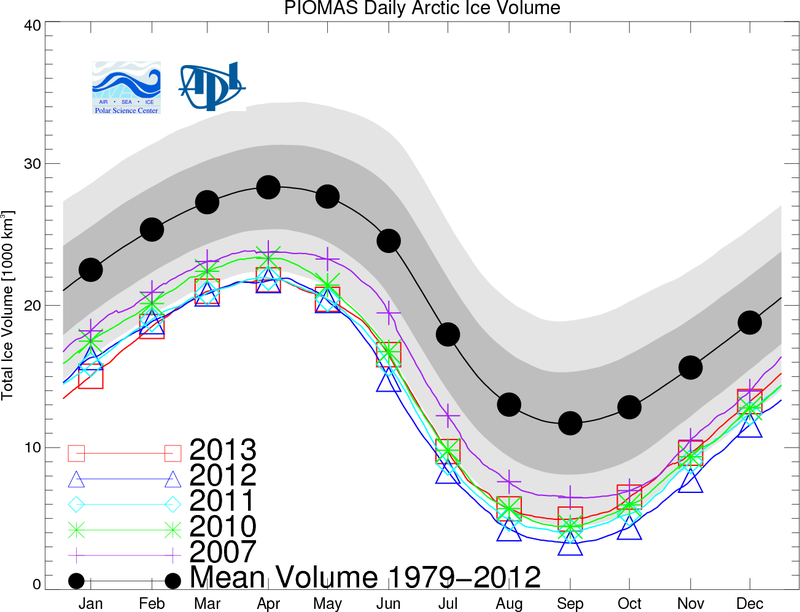 The falling year to year sea ice in the arctic is just one of the measures. and I don’t see any indications of runaway global warming. Do you? Are you really that worried about the estimated 7% increase in methane emissions between 2003–2007…? I think you over-value the papers quoted. The first was almost immediately rebutted : Boron isotopes and B/Ca in benthic foraminifera: Proxies for the deep ocean carbonate system. The second concerns only one (Mg/Ca) process among many (and a process that has not been in use long). Additionally, the Mg/Ca process appears to have a sensitivity problem only for certain species and only at very high carbonate concentrations. Except for one study cited in the paper, I don’t know of any others affected by the results. In the arctic it’s not so much the analysis of benthic foraminifera, but their existence or non-existence. Many species need open water above them – including many foraminifera species By tracking their presence or their absence we can recreate ice extent. The same is true of bowhead whales, they need to surface to breathe and don’t travel far under the ice-pack. Tracking the location of their fossils gives us an outline of the ice extent. Similarly organic debris can be tracked. Periods when the arctic ocean is completely frozen over means little or no organic debris will settle to the ocean floor. Periods when the ice is open allow for debris to be deposited. Temperature itself is really not a proxy for ice extent. Looks as though the UK Met. Office are covering their backsides as usual. I will stick with 5.5+ because my models have dried out and fallen off the wall. Yeah like the Arctic summer is probably a bit warmer than it was in say 1900 or 1700 for that matter. I haven’t read all the details in that report, but I don’t see how the Arctic Ice is anywhere near as low as it was when Greenland was Coloinsed by the Vikings. Their settlements are still UNDER the current Ice, so we haven’t even got back to the retreat of Ice that they experienced. So obviously the Arctic Ice Death Spiral that they observed somehow reversed itself. Don’t play the CO2 card making it worse as it won’t wash, they had a bigger melt without any ACO2. Things don’t just melt. If there is a change in the climate, then there has to be something forcing it. And just because it was warmer in Greenland doesn’t mean it was warmer right across the arctic. Where are your other data points? This is what gets me about the ‘natural cycles’ argument.No-one ever bothers to actually put up any kind of evidence as to why these supposedly natural cycles occur. And everyone seems to have a different theory about how long they are supposed to last (complete with dodgy graphs). People watching the satellite era ice extents is a lot like ants watching the spring snow melt in the Rockies. The short life span would convince the ants the snow melt is “unprecedented” and will lead to a “catastrophic” loss of water. Sometimes, when I have absolutely nothing else to think about, I wonder what the Arctic ice extent was back during the Viking era. I have to agree Kevin O’Neill’s comment on that one. Another question, which I have asked before, who cares? What would be the impact of all the Arctic ice going away? My guess, life would be a lot easier for plants and animals in the Arctic regions. Polar bears, for example, would simply go inland and eat caribou as a long term inhabitant of the Hudson Bay area explained to me. He said the biggest change he has seen in the last thirty years is this shift in Polar bear diet. No surprise there, these are bears. These are the same creatures just as happy to eat garbage as rabbits. Shipping, fishing, and oil exploration would be a lot easier. I know June extent means little for September, but we’re hitting record lows again, and it’s hard for me to get excited about a recovery when that happens, regardless of the date or how long it lasts. Can’t wait to see whose prediction is closest! It’s interesting that the Barrow ice break out forecast is now behind all of the years since 2000. At one time it was ahead of all but 2007.
yes by whom? The Team. The method of tracing ice extent by forimina, whales etc has also been discredited. The problems highlighted were movement caused by sea currents, bottom touching ice, sea animals, etc. There really is not a good proxy for ice extent on sea water. With the biggest nappy/dipper/couche they could find. Not so much a forecasting unit but a ‘mystic meg’ entreprise. Arctic sea ice extent has nothing to do with Arctic summer . http://ocean.dmi.dk/arctic/meant80n.uk.php Since 1958 temperatures are not rising for the Arctic area north of the 80th northern parallel This means it has nothing to do with CO2 . This means that also warmer sea currents are not to blame because that too would rise the temperature in summer. We are talking about sea ice here. The settlements were on land. Different thing altogether. Steven Goddard captures the pictures here: http://www.arctic.io/satellite and shown is the lowest extent since 30 years for this date. Don’t know why it looks good, maybe because it could be less? I don’t know where you get your information. Many of the old Norse farms have been excavated. You can visit them. There are decent images of them on Google. Try searching greenland norse settlements today and selecting IMAGES. Pray tell, how did the prediction based on the PIOMAS model do last year? We could then at least confirm or reject the fears of the warmists that the Earth would enter a death spiral of rapidly increasing temperatures. If confirmed, we’re toast; if rejected, we save a ton of tax dollars that have been chasing this chimera. Given that the records apparently indicate that CO2 lags temps historically, my money is on the tax dollars being saved, so I hope the day comes sooner rather than later. You have not provided any hard data or facts. You are using half a cycle of satellite data (from a high point) to claim ice is melting rapidly. Thank you for your comments Kevin O’Neill says: June 18, 2011 at 10:16 pm You raise good points, however sea ice would be at the same altitude near both poles. So something else is going on in the north. The temperature anomaly for GISS (http://data.giss.nasa.gov/gistemp/tabledata/GLB.Ts.txt) went DOWN by 0.19 from April to May. However that did not slow down the sea ice loss in the north. I wonder how much of an effect the Iceland volcano had on the more rapid ice loss in the Arctic. 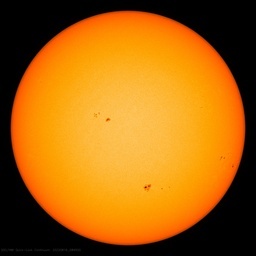 In addition to more black soot from China as they are rapidly increasing their number of coal plants, ash from the volcano on the sea ice could also help the sun’s rays get absorbed more. Meanwhile of course, the overall arctic sea ice is at or below modern satellite records for this date. Sounds like you may be fairly new to the study of sea ice. I am not using “half a cycle” of data, but rather am looking at the full set of data going back to the 1970’s. We always compare year-to-year data (i.e. The same date each year) when talking about declines. Going back over 30 years, for this date in June, we are at or near record lows. Where are your other data points? This is what gets me about the ‘natural cycles’ argument.No-one ever bothers to actually put up any kind of evidence as to why these supposedly natural cycles occur. I don’t need any data points, or know why the cycle occurred. Because the one thing we can be absolutley certain of is taht it wasn’t ACO2 ie Anthropogenic CO2 1000 years ago, so it must have been a natural cycle. Forgive me if I misunderstand you, but there is no sea ice near the South Pole, as there is a continent in the way. And I see you want to blame sea ice loss on “ABC”, like many others here. Very funny and would be true if ants had the consciousness to watch snow melt, had satellites, the rockets to launch them, the computers to guide them and process the data, and of course, could do this over many decades. But other than those things…yes, it’s exactly the same. Not worried at all. I’m simply observing the facts of the situation. Methane my be 22 times more potent a GH gas, etc. and we may get even more of a positive feedback effect if methane levels continue to rise, meaning that warming will lead to still more warming (exactly, by the way, as may occur from Milankovitch cycles). Presently, though, I am more concerned with our National Debt, my children’s college tuition, the price of food and gas, than with the rise in methane emissions.
? Not sure the intention of this comment, but I too, as a “warmist” would like to find the reasons behind sea ice loss, and would approach it in a logical way, thinking that there could be many interacting pieces of the puzzle, and rather than something simple, like increasing CO2. Just as in Milankovitich cycles, where it is the change in solar insolation that eventually seems to set off a chain of events involving reinforcing positive feedback loops that brings about a change in climate that is larger than the change in NH insolation alone would produce. Now, rather that a change in insolation, we have seen a change in various atmospheric GH gas concentrations that could, through various feedback loops, create an effect that is greater than the increase in CO2 alone would produce, It is this polar amplfication of the greenhouse effect that is most interesting to me, so that, yes, I’m interested in A, but also in B, C, D, etc. which tell the story how how one change can lead to many others. I think you over-value the papers quoted. So the Fram Strait has a “rather atypical depth distribution of the planktic foraminifera” and significant “temporal wind-induced variations” in ice fluxes in the Fram Strait “seem more to be the rule than the exception over the whole period considered.” Can you cite any reputable sources indicating that Fram Strait foraminifera are an accurate proxy for Arctic temperature? The first was almost immediately rebutted : Boron isotopes and B/Ca in benthic foraminifera: Proxies for the deep ocean carbonate system. Thus the paper you cite deals with validating foraminifera as a proxy for pH, and says nothing about the accuracy of foraminifera as a proxy for temperature or sea ice cover. “A specific example of where cruise ship traffic is increasing at a rapid rate is off the coast of Greenland. As Table 5.3 shows, cruise ship visits and the number of passengers visiting Greenland has increased significantly between 2003 and 2008. For example, between 2006 and 2007, port calls into Greenland increased from 157 to 222 cruise ships. The number of port calls in 2006 combined for a total of 22,051 passengers, a number that represents nearly half of Greenland’s total 2006 population of 56,901. So why are you supporting R. Gates’ obviously erroneous statement that, “a reasonable person would come to the conclusion that the Arctic is warmer than it has been in at least several hundred and perhaps several thousand years.”? How does the sodium chloride content of water affect the temperature at which ice melts? -i.e. at a given temperature, which is better at melting ice: saltwater or freshwater? So then we agree that there is no sign of catastrophe and no need for alarmism? I’m simply observing the facts of the situation. Methane my be 22 times more potent a GH gas, etc. and we may get even more of a positive feedback effect if methane levels continue to rise, meaning that warming will lead to still more warming (exactly, by the way, as may occur from Milankovitch cycles). Here we agree again, three times in one thread, almost certainly a record. Can we agree that your statement that, “a reasonable person would come to the conclusion that the Arctic is warmer than it has been in at least several hundred and perhaps several thousand years.” is baseless and erroneous, and move on to enjoy the rest of our Sunday? I’ve been accused of not having a sense of humor, which is totally untrue by the way, it just happens to be as dry (precipitation-wise) as the center of Antarctica. Are you really a NOAA programmer? So I assumed this was talking about sea ice beyond the land mass. However since you brought up this point, I thought I would check and found the following: “Antarctic Sea Ice Extent” graph in the WUWT Sea Ice Reference Page so I see nothing wrong with what I (nor Keith) wrote. But I admit I could have been more precise and not mentioned the South Pole and just left it as Antarctic. The ice thickness looks to be much more robust this year as per the picture against 2007. I suspect the latter part of the ice melt season will have less than normal melt. Meanwhile, some major cold developing over the north shore of antarctica should lead to their usual spike and the approach of total global sea ice to near normal. I wonder if Wilson bothered entering this year or whether they filtered him out? I suspect the latter part of the ice melt season will have less than normal melt. So you suspect it’s getting colder than normal. Is there a summary of last years June predictions compared to the September result? @ John B, who asked are you really a NOAA programmer? Not currently, but in the mid-1970s I wrote FORTRAN programs for Stan Barnes and Doug Lilly in the SESAME (Severe Environmental Storms and Mesoscale Experiment) program in the Environmental Research Laboratories in Boulder, Colorado. I assisted in the statistical analysis of meteorological data for determining the spatial distribution of sites for automatic data gathering. >part of the ice melt season will have less than normal melt. It is easy top then estimate the average thickness as Volume / Area or Volume / Extent. Either of these shows thinner average ice than ever seen in the 30 years of satellite records for Jan, Feb, Mar, & Apr. Cool! So, are they all charlatans, as would seem to be the general impression here? We’ll be lucky if we get above zero this year. Also, considering the Antarctic has a much larger area of sea ice how come the increase there is not helping? Because the word “slight” is better applied to the increase down there. Yes, you are using half a cycle. The full cycle lasts about 60-70 years. The “full set of data going back to the 1970’s” is half of the cycle. The satellite data started at the high point. Check the news headlines about melting over the last 150 years. resulting in Global Sea Ice Area of 19.099 Million Sq. Km, with a 1.25 Million Sq. Km negative anomaly. This represents a 6.6% negative anomaly in Global Sea Ice. Is this slight? Questionable. How about I refer to it as a small negative anomaly until it goes over 10% or under 5%?